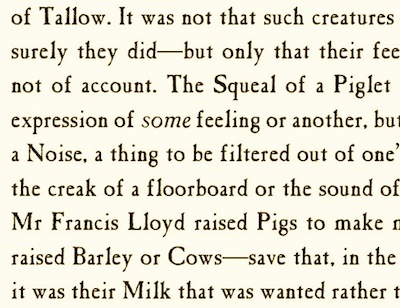 Many readers have commented on the language of Pyg, especially its evocation of the style of a late 18th-century novel. Of course it would be both foolish and impossible to actually try to recreate the precise diction of the period, but one can, with care, manage a sort of allusive modern take on this language, creating something that has all the antique feel but -- hopefully -- is eminently readable today, a language the novelist David Mitchell has dubbed "bygonese." And yet, along with the careful use of just the right admixture of the musty and the immediate, there was another challenge awaiting me: I did not want to use any words or phrases that were unknown as of the book's imagined publication date of 1809. Few people would have noticed, I suppose, but it seemed to me vital not to have any anachronistic words or phrases -- particularly Americanisms! -- in a novel meant to evoke a very particular period in British history. In this task, I called upon the support of several allies. First and foremost was my copyeditor Hazel Orme, whose eye for detail was precise and observant. Second, I had the collective wisdom of the Oxford English Dictionary, certainly the best historical dictionary of its kind. All the same, I found that a third resource -- Google books -- was important as well. For all their wisdom, the editors of the OED had not the ability to scan at once through millions of pages of text; they had to rely on individual readers submitting slips. True, the resources exist today, but revising something as massive as the OED is a considerable task; Rome wasn't built in a day, and the OED won't fully benefit from older digitized books for some time to come yet. Thus, I was able at times to find a word in use during the period the novel is set, even though the OED showed only later examples. Speaking of Rome, the adage which opens the novel -- "When in Rome, do as the Romans" -- was itself a bit of a "squeaker"; while the Latin form of this proverb dates back many centuries to St. Ambrose, and was famously Englished by Robert Burton, it did not take the exact form used in the novel until 1780 -- scarce a year before Toby's birth. 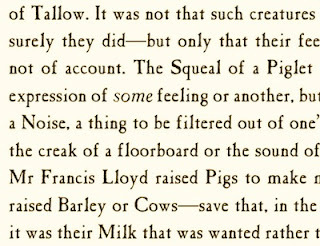 And while we're on "squeak," though that verb was indeed attributed to pigs, along with "squeal," the word "oink" -- the one most readers would specifically associate with pigs -- turns out to be an American coinage dating back only to the 1930's. Among the many other Americanisms which had to go were "passel," the "leg" of a journey, "on the house" (in the sense of complimentary), and "a tad." And yet there were a few hardy survivors as well: "sticking plaster," "autopsied," and "feel the taste" among them. Hazel thought that "sticking plaster" might be anachronistic, but Google Books turned up a recipe for it in John Quincy's Pharmacopoeia Officialis of 1782 (he recommended a mixture of "common plaster" and "yellow resin"). As for "autopsied," the OED gave 1839, but Google Books pushed the earliest reference to 1823, close enough I thought. Lastly, when Toby vows that he will never more "feel the taste of pasteboard in [his] mouth," I was able to find this synesthesiac phrase in an Edinburgh medical journal from 1771. Google books, indeed, is especially useful for phrases, for which comprehensive reference works are scarce. I learned caution as well -- many Google books are inaccurately tagged by date -- a date on a bookplate or a call slip is often mistaken for a date of publication, and many books have generic dates such as "1800" which can be as much as 99 years off, or entirely inaccurate; one must use the date range restriction with care. And it certainly can't provide negative evidence as to the lack of a certain usage; the abundance of OCR errors in its searchable text precludes it. Nevertheless, it's a fabulous supplement to the OED, and an invaluable one for any historical novelist seeking to avoid the jangling sound of a word uncurrent to the novel's era. Interesting point about the OED Russell. In fact they've embarked on a multi-year programme to take advantage of all the new corpora of scanned books in finding new citations, one letter at a time. A friend who works on this tells me that the effect has been to find earlier citations than the previous earliest-known for thousands of words!